Friendly natives greet hikers at the general store. Nice coffee and cake stop and to refill your backpack with goodies. The half-way point of the Track is the historic mill town of Donnelly River Village (DRV) nestled in the valley of the river from which it was named. DRV is now a holiday village famed for its tame wildlife and tranquil forest setting. The village takes you back to the 1950s with an original steam mill, 35 worker’s cottages, Old Boarding House, workers club and the general store. The town was named for the river which flows through it, which in turn was named by Governor James Stirling after Admiral Ross Donnelly, a friend of his wife's family and Rear Admiral of the Red. Although the town was officially called Wheatley the name Donnelly River is more commonly used. 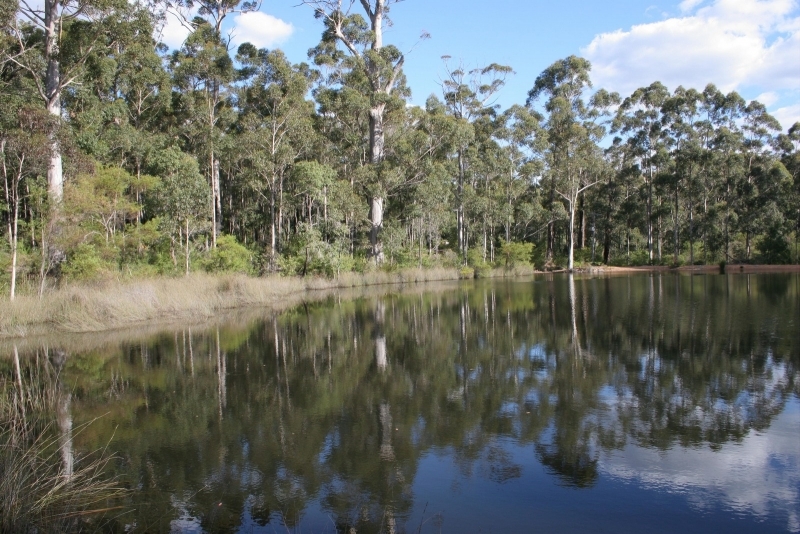 The Donnelly River site was first used as a timber mill by the Wheatley family in 1912 to cut cross arms and telegraph poles, but it closed after two years. In 1947, Bunnings made plans to build a new mill on the Wheatley site to work timber in new permit areas held by the company, with a steam engine purchased from Onkaparinga Woollen Mills in South Australia - Donnelly River became the only steam-driven mill in the South West, officially opening in 1951. The mill and town subsequently provided employment and family homes for a large community for nearly 30 years - many of these families have remained in the district. It was shut down in 1978 as part of a Forests Department policy to close less efficient mills, and is now heritage-listed. 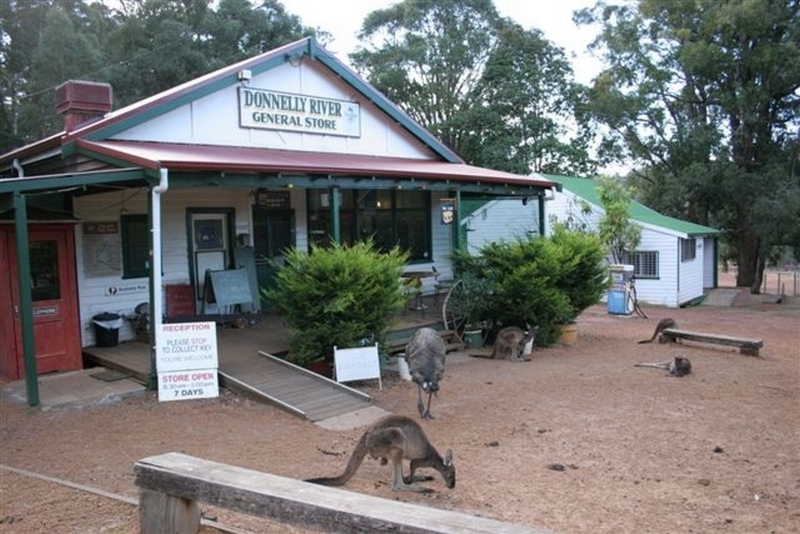 Enjoy a latte on the verandah on the General Store and get to know the locals – a large number of very tame kangaroos and emus. The Donnelly River swimming hole, 500 metres from the Village, is a great spot for a swim. Balingup is 57.2km north of DRV – a 50 minute drive. 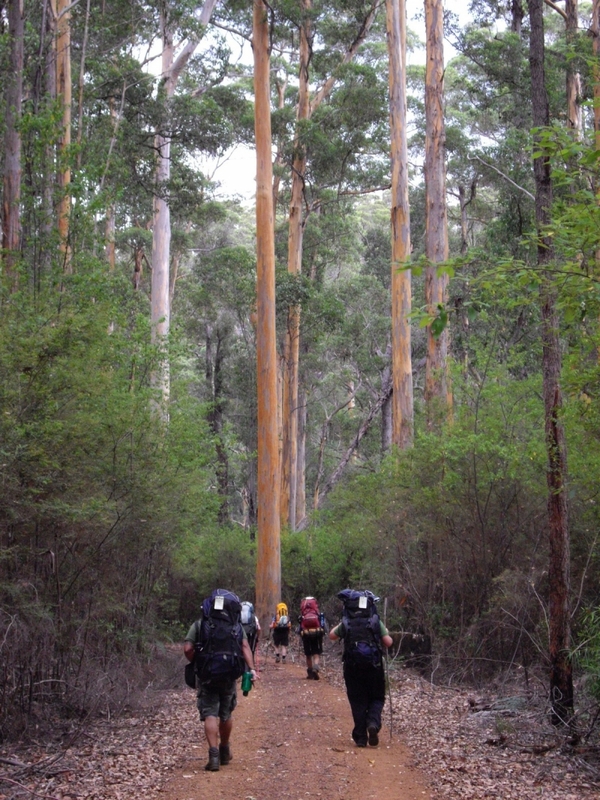 The walk between DRV and Balingup (56.2km) takes three days. Pemberton is 57.6km south of DRV – a drive of approx. one hour and ten minutes. The walk between Pemberton and DRV (101.6km) usually takes five days. Bunk accommodation in the old school with access to kitchen and bathing facilities at a budget price. Note, we dont take bookings, but advise to call in advance if in groups of 4 or more, or likely to be arriving after 5pm. The General Store is open every day of the year from 8.30am to 5.00pm and is the focal point of the village. It offers a range of services including a café with delicious homemade cakes, a full café menu, basic groceries and locally made giftware. The store stocks many items just for walkers including Maps 4, 5 and 6 and the Southern and Northern map packs; as well as takeaway food packages for dinner and frozen barbecue packs. There is a public phone at the store as there is no reliable mobile reception at the Village. Laundry facilities, including dryers are also available. In addition to providing walker supplies, the general store can pick up your mail packages and keep them in the store for the arrival date marked on the package. Send packages at least a fortnight prior to your arrival to C/O Donnelly River Village, Community Mail Bag, Manjimup, WA, 6258 with your name clearly marked and expected arrival date. Make sure you notify them first - mail is only collected from Manjimup once a week so make sure you allow plenty of time. Track drop-off and pick up transfers for your walks in the South West.